The most easterly of the four provinces was settled by European fishermen in the 12th century. 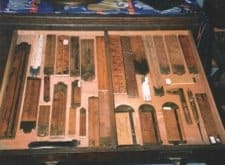 The extreme poverty of its coastal people during the early years resulted in them having few material possessions and, apart from an occasional early edge tool, most of the surviving hand tools are 19th century and made in England. Settled by the French in the 16th century and taken over by the British a century and a half later, New Brunswick’s economy was based upon its vast pine forests. Lumber mills, foundries and edge tool factories were established at the mouths of Its major rivers, while shipbuilding flourished along the shore and carpenters and cabinetmakers, mostly from the United Kingdom, built and furnished elegant homes for the rich merchants. 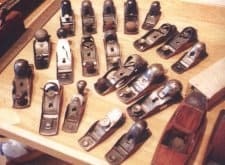 Virtually every class of manufactured 19th century hand tool can readily be found in the province, in particular, locally made edge tools and British wooden planes. Also settled by the French and taken over by the British, Nova Scotia’s two main industries were the North Atlantic fishery and, not surprisingly, wooden shipbuilding. On account of the difficult terrain, most local and inter-provincial transportation and communication was by sea. As a result, every imaginable trade was represented in virtually every community of any size. 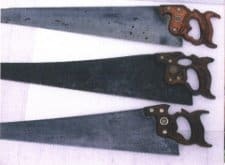 This enforced Isolation has left us with a rich heritage of hand tools, from early 15th century French pieces, to traditional 18th century German planes and a wide variety of early New England Colonial tools found in the Annapolis Valley. Situated in the Gulf of St. Lawrence, the economy of this low- lying, fertile province is dependant upon its agriculture and, in the main, potato farming. A lobster fishery is pursued during the open season and, until most of the island timber had been cut in the late 19th century, wooden shipbuilding was of some importance. 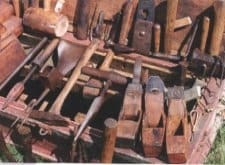 While a few hand tools survive from this period, most of the early tools and implements found on the island are agriculture-related and many are hand forged.